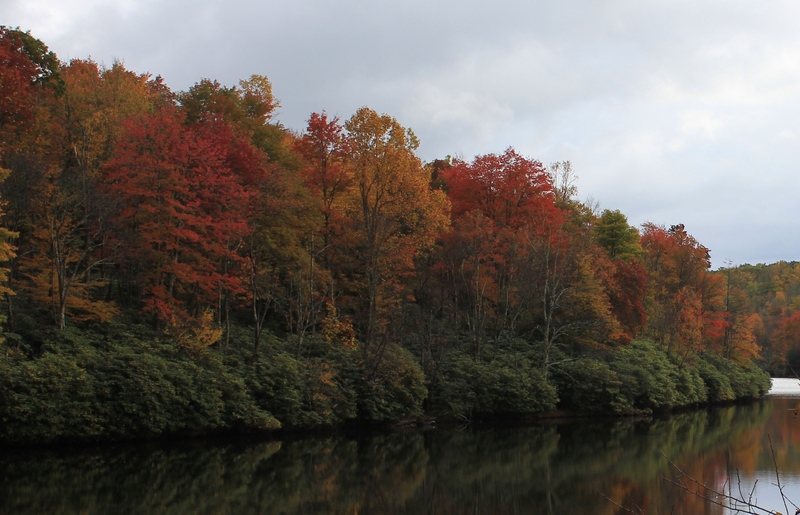 On Sunday, October 13, 2013, we went over to the North Carolina High Country to hike Grandfather Mountain during the peak color change. Unfortunately, it was cloudy and drizzling. 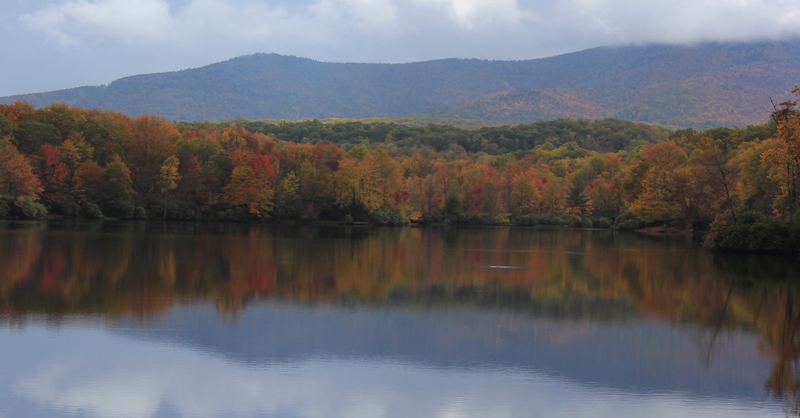 As we drove down the Blue Ridge Parkway towards Blowing Rock, the skies below 4000 feet cleared and created ideal conditions for these photos showing the fall colors and reflections on Julian Price Lake. The section of the Blue Ridge Parkway that skirts around Grandfather Mountain is most impressive. This is the site of the famous Linn Cove Viaduct, where the Parkway is raised up on pylon-like stilts and skirts around part of the mountain as if suspended in midair. This whole section of road has impressive views of the mountain, and off to the east and southeast, all the way to the Piedmont region. 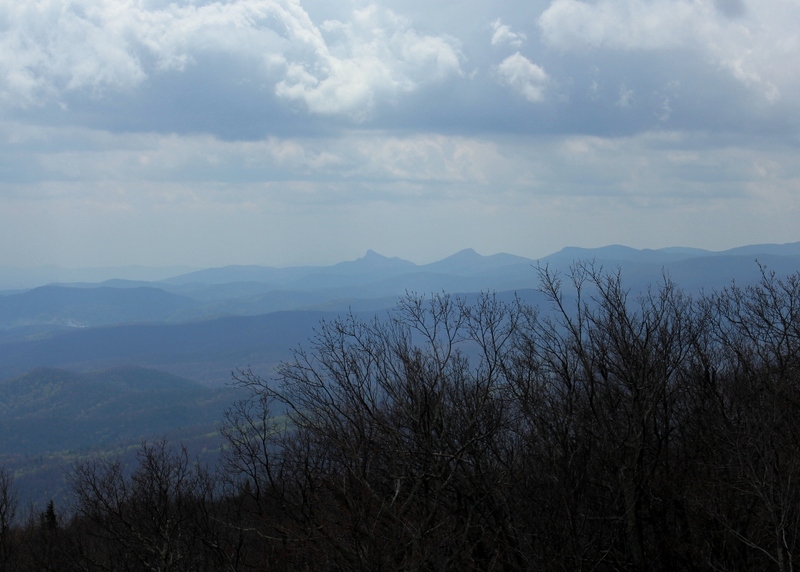 The photo above was taken in March near mile marker 302—right before you begin rounding Grandfather Mountain when approaching from the Blowing Rock Area. Low hanging cumulus clouds accentuate the blueish hue of the mountains. The photo views the mountains and hills to the southeast (Grandfather Mountain is not in the picture but is to the right from this viewpoint, on the other side of the Parkway from this turnoff). 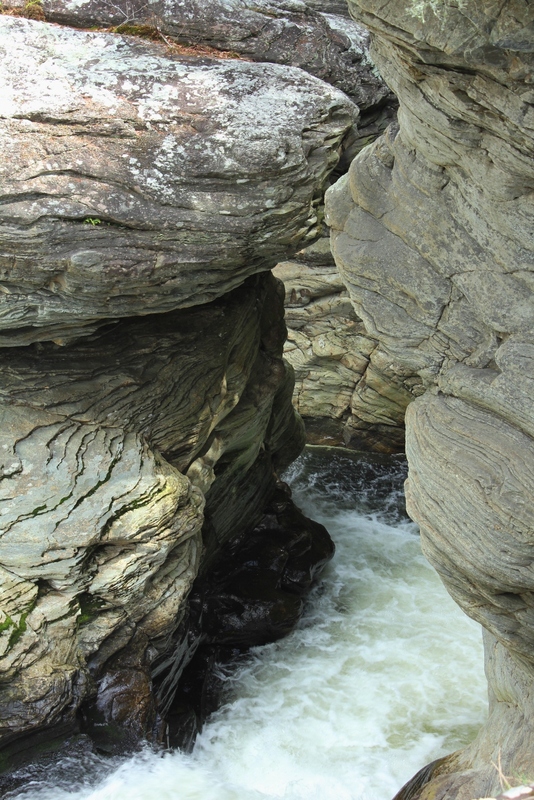 This March we visited Linville Falls, one of the most famous waterfalls in North Carolina, during the 2012 Banff Film Festival in Boone (the inspirational film festival trailer can be seen here). 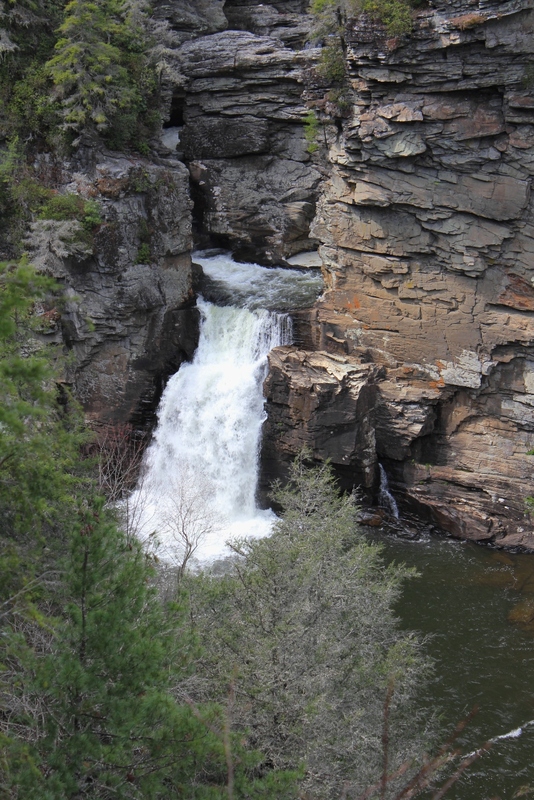 The falls are located just off the Blue Ridge Parkway at mile marker 316. There is a visitor’s center and a short hiking trail (about .8 miles) to the falls. The closest viewing area shows the upper falls (not pictured here) in one direction, and beginning part of the lower falls in the other direction. The photos above and below show the beginning part of the lower falls. The lower falls churn through a cavernous semi-circle of eroded limestone, and then plummet about 45 feet into a large pool. “Chimney Rock Overlook” can be seen from the upper viewing area, as highlighted in the photo to the right. From Chimney Rock Overlook, you can see the lower falls in their entirety, as well as the large cliffs that surround the falls and mark the beginning of the Linville Gorge. The cliff face next to the lower falls is as impressive as the falls themselves. When we viewed the falls, there was a relatively large volume of water flowing. This caused the falls to jettison outward from the upper pool. Linville Falls is a very popular stop on the Blue Ridge Parkway (the parking lot at the visitor center is huge), so it is recommended that if you want to visit the falls without hordes of tourists, you should try to see them during less visited times of year such as in spring or winter, or during the middle of the week. The viewing areas were built in a manner to try to fit into the natural surroundings and are constructed of stone and logs. When they are wet, it is possible they could be treacherous. In particular, the Chimney Rock overlook could be dangerous if someone got too close to the edge of the viewing area, as a fall from that location could be fatal. 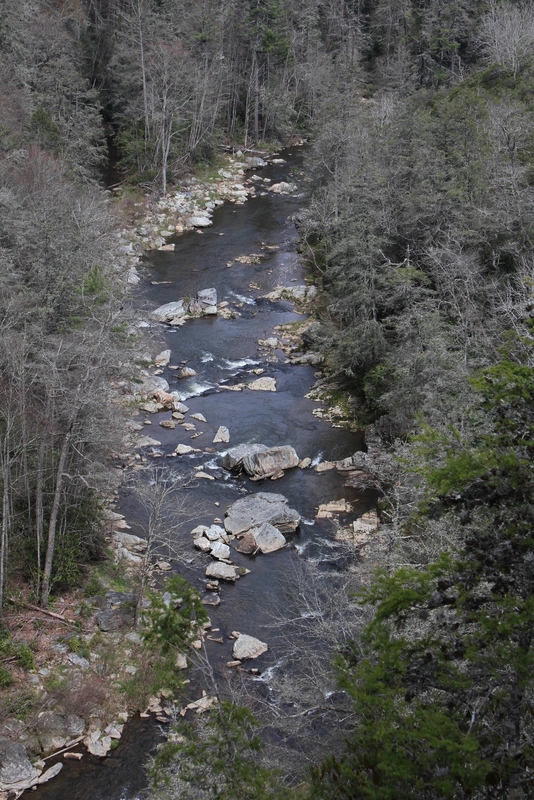 The Linville Gorge is one of the deepest gorges in the Eastern United States. 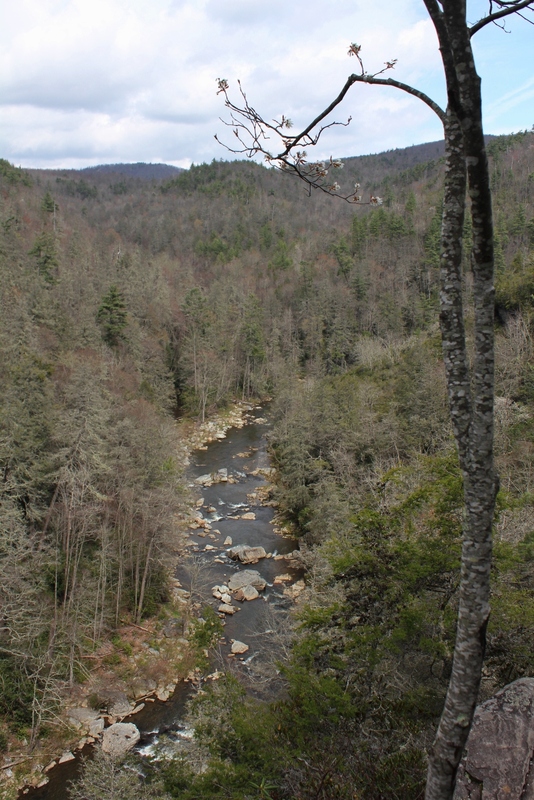 I have seen claims that it is in fact the deepest, but there are several others that are comparable (including the Russell Fork Gorge in Southwest Virginia). Suffice it to say that it is deep and impressive. Experienced hikers have become disoriented and lost in this place. The Linville Gorge reminded me of the gorge below Abrams Falls close to Abingdon, although without doubt the Linville Gorge is much deeper and longer. 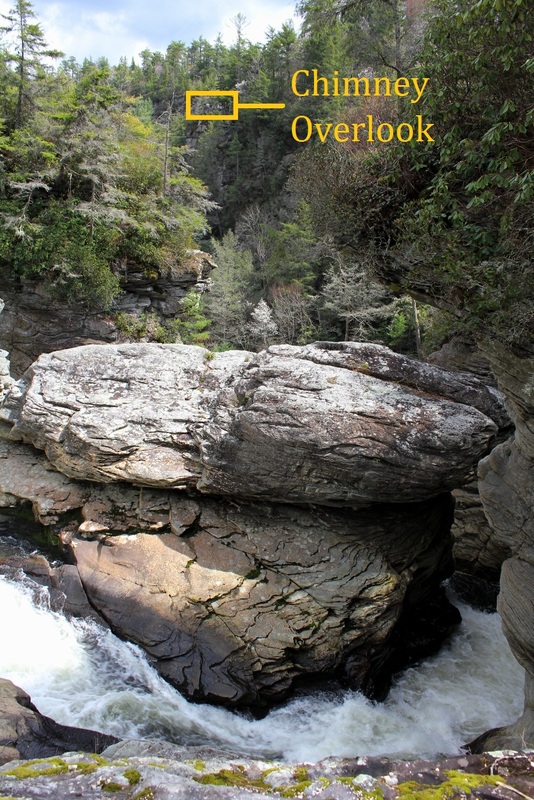 If you find yourself in Boone, Blowing Rock, or on the Blue Ridge Parkway in this neighborhood, a trip to Linville Falls makes for a nice day trip and provides a nice little outdoor experience without too much effort. 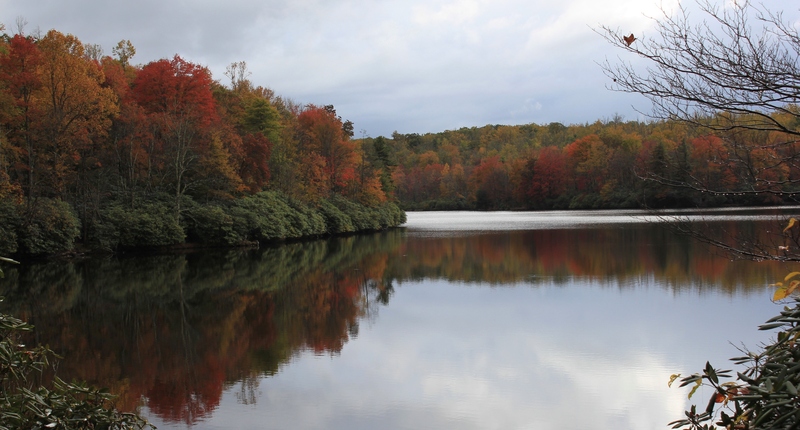 Most folks who visit Blowing Rock, North Carolina are on vacation from far away, usually in summer to escape the oppressive heat in places like Florida or maybe Charlotte or Atlanta. Not so for Abingdonians—for us, it’s just hop, skip, and jump over the mountains. It’s exactly 60 miles from Abingdon to Blowing Rock. Perfect for a day trip. Well Maintained Carriage Paths Encircle Bass Lake, March 2011. 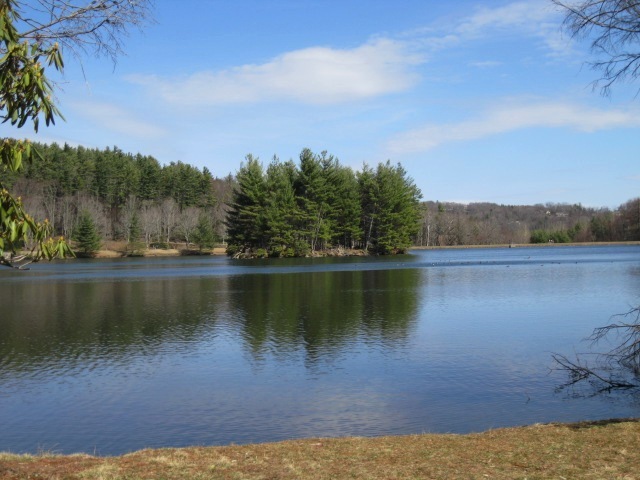 About a mile outside of Blowing Rock, just off Route 220, is the entry to Bass Lake, part of Moses H. Cone Memorial Park. 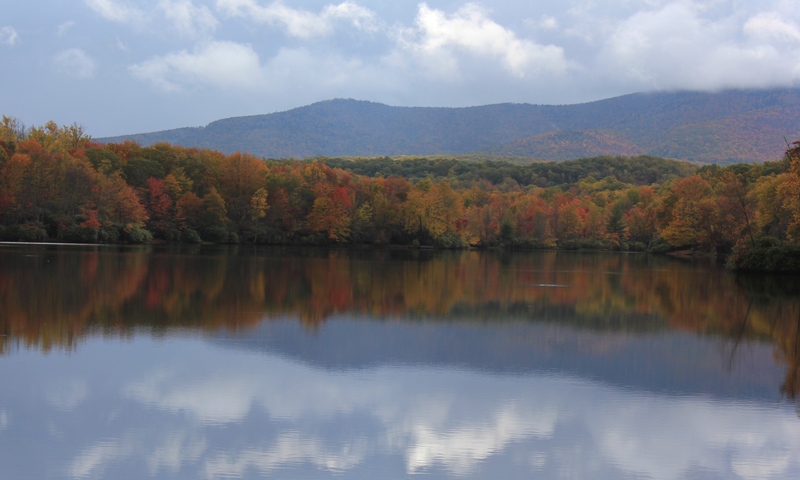 An easy day trip from Abingdon (although certainly meriting a long longer trip if desired), the Moses H. Cone Park is a large, outdoor park managed by the U.S. National Park Service. We have been visiting this park for years. 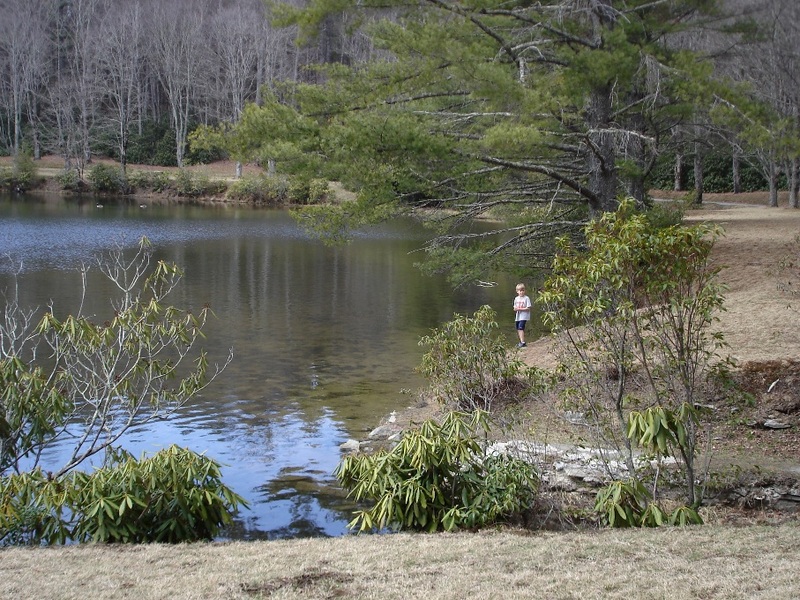 One of our spring rituals, when it’s warming up and we are getting cabin fever, is to come over here on a March weekend, before the crowds swarm Blowing Rock. 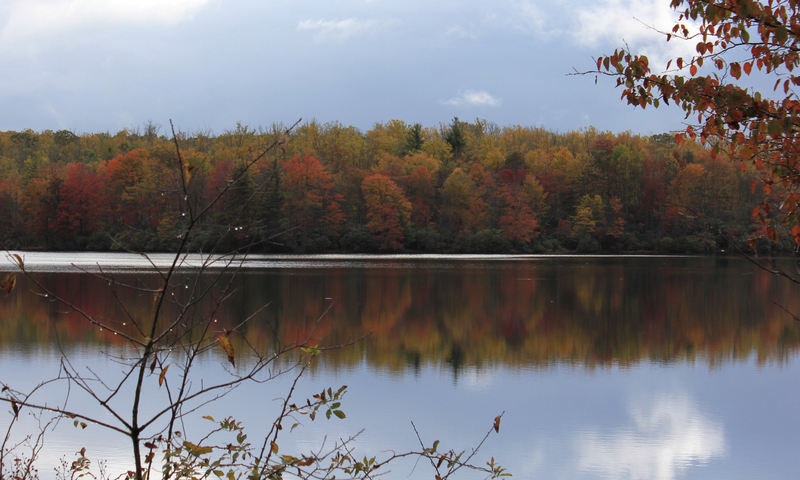 The walk around Bass Lake, about a mile, is the perfect family walk. There are a multitude of trails lacing the park that go far beyond the lake. A map of the trails, somewhat dated, from the National Park Service is located here. 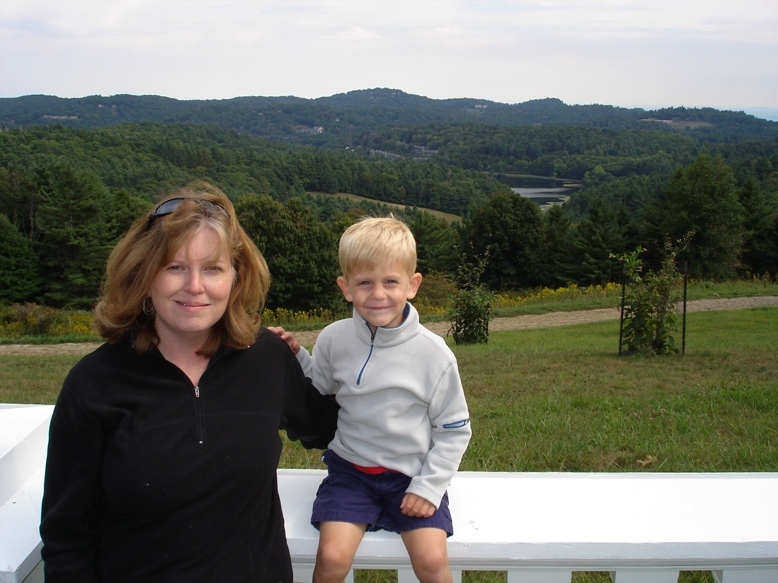 Mrs. Abingdon Outdoors Revealed: Joanne and Isaac on the porch rail of the Cone mansion, circa 2007. Note the view of the lake in the background. This is a great place to come to relax—lunch at one of the many restaurants in Blowing Rock and a stroll around the grounds of the estate makes for a nice day. 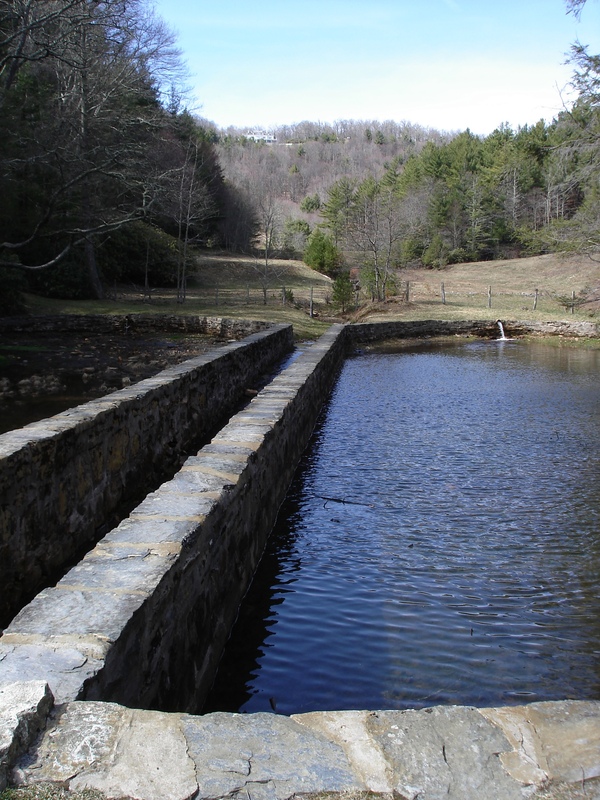 Aqueduct leading to Bass Lake. Note the mansion at the top of the photo. Moses H. Cone was a textile magnate that built his country estate in the very early 1900s similar to Vanderbilt’s estate in Asheville. The Cone estate is not quite as exorbitant as The Biltmore, but with 3,500 acres of land and a 13,000 square foot mansion that overlooks the mountains, it’s undeniably grand. 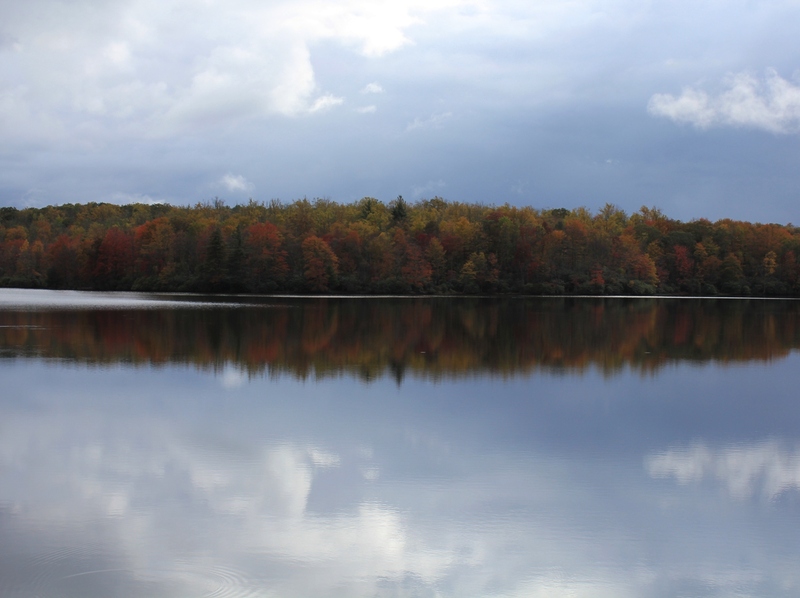 The estate was designed with the mansion, which sits at about 4,500′, overlooking the man-made lake and the carriage trails that meander down towards Blowing Rock. More information on the background to the creation of the estate is located here. 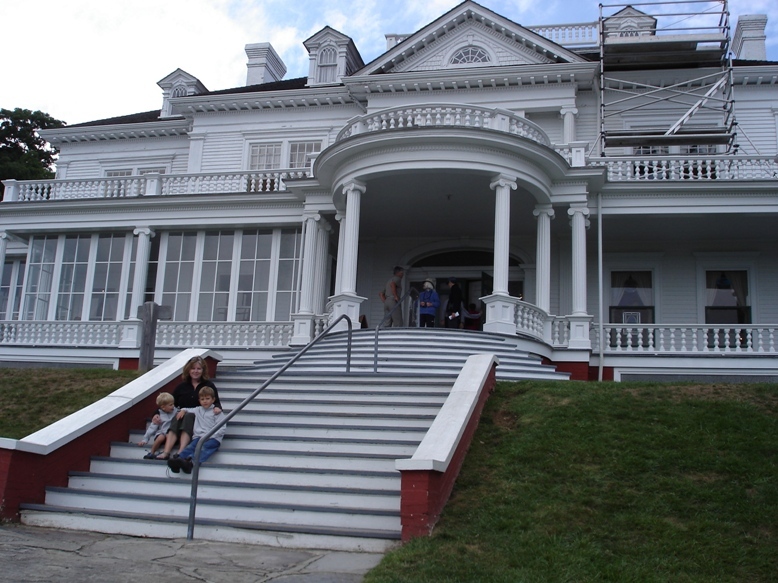 The house is open to the public, and is accessed off of mile 295-298 of the Blue Ridge Parkway. While the mansion is worth a visit, what keeps us coming back are the grounds. 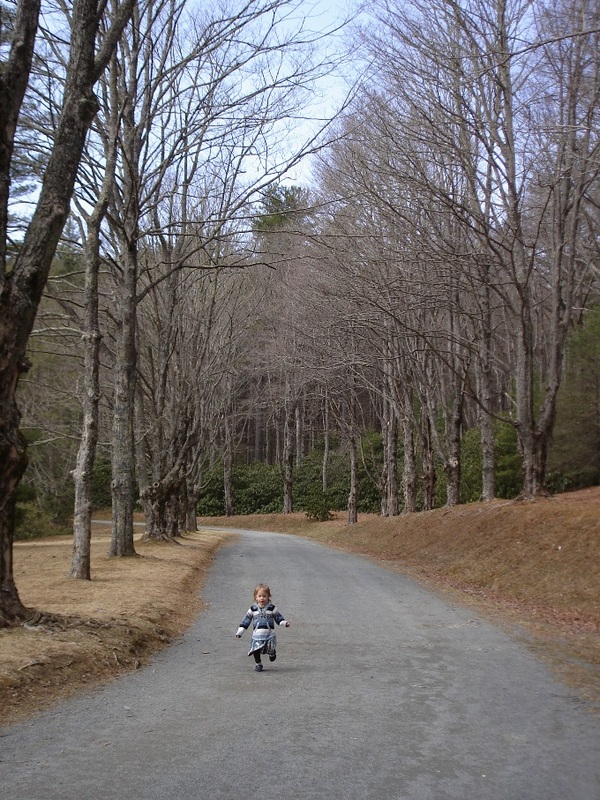 Imagine Virginia Creeper Trail type trails: well-maintained cinder or pea gravel covered trails. The trails crisscrossing the ground make for an excellent area to train for running. In fact, most times you are here you will see some locals, part-time residents, or visitors running on the carriage trails. 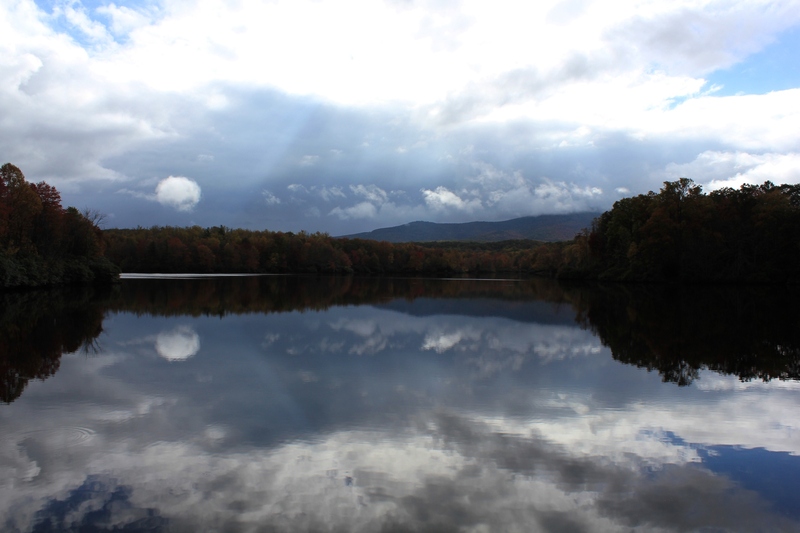 Next time you are in the Boone-Blowing Rock area, check out this park. You won’t be disappointed.